Recently I visited the National Museum of the Mighty 8th Air Force in Savannah. While there I had the opportunitiy to view and photograph the pages of the 487th Tower Log book that is at the museum. It contains notes by the control tower officers relative to operations from 12-Apr-1944 to 22-Aug-1945. 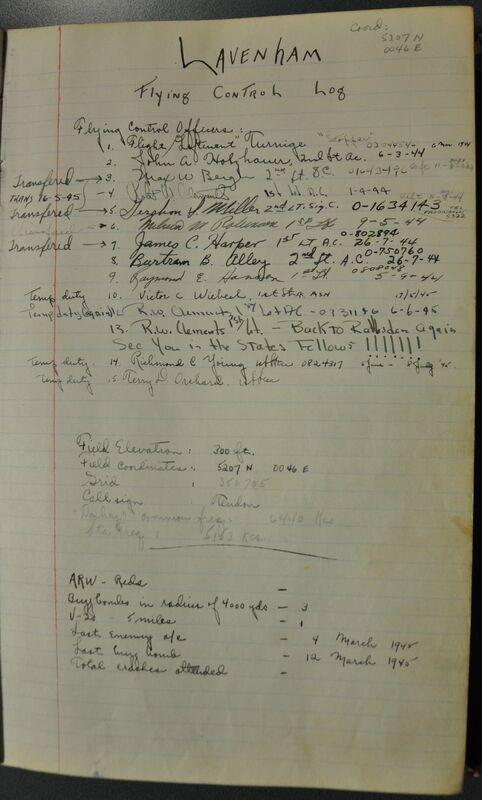 Later the log book was used at reunions to record those who attended reunion events. The pages presented here were "photographed" and not "scanned". This is because of concern that laying the log book flat on a scanner could damage the binding of the book. Because of this the images are not always in perfect focus as the book was being held while I photographed each page. I apologize for the less than perfect results. These images show information related to the day to day operations of the 487th Bomb Group (H) from Station 137. To view any page of the Tower Log, click on the date/page you want to see, then when done use your "back" button to return to this page.